GRAFENWOEHR, Germany — The Rose Barracks library branch reopened at a new location and is back to providing full services for its patrons after a two-week closure. The library branch was closed April 18-29 so garrison staff could move to the renovated building at Bldg. 227. The library at Rose Barracks officially opened its doors again with a ribbon cutting ceremony May 2. “Our commitment to offer quality programs and work toward customer satisfaction led to the library relocation from Bldg. 2222 — which has been the library’s home since the mid-90s — to Bldg. 227,” said the garrison’s chief of staff Col. Bill Rieper, during the ribbon cutting ceremony on Monday. The entire branch library’s collection was moved into the renovated building, which used to host the Ristorante Rosalia. Old and outdated furniture was replaced to improve the customer experience. “I was at a site visit at Ledward Barracks in Schweinfurt — close to the time of the garrison’s closure in 2014 — and noticed that their library was equipped with fairly new furniture, which would upgrade the overall appearance of Rose Barracks library,” said Siegfried Schieder, the garrison’s librarian. “I asked if we could have it (furniture) after the closure and they said yes,” he added. Despite the two week moving process library services were available for Rose Barracks customers. The garrison’s libraries strive to provide Soldiers, civilians and their family members with current and retrospective multimedia material in all subject fields. 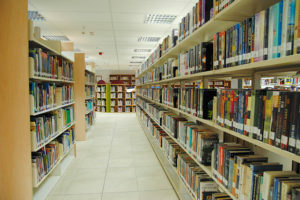 The Rose Barracks branch library offers over 20,000 books, more than 5,000 CD’s and blue-rays, close to 1000 music CD’s, various language kits and video games. Services include free Wi-Fi, reference assistance, online catalogs, interlibrary loan service, a computer lab, 14 public PC’s and weekly, monthly and seasonal programs. “Please take advantage of this great program,” said Rieper during his remarks. The Rose Barracks library branch opening hours are Monday through Friday from 11 a.m. to 6 p.m. The Tower Barracks main library hours are Tuesday through Thursday from 11 a.m. to 7 p.m., Fridays from noon to 6 p.m. and Saturday and Sundays from noon to 5 p.m. The garrison’s libraries offer Children’s Story Time program free of charge. The weekly event takes place Tuesdays from 10 a.m. to 11 a.m. at the Rose Barracks library branch and Wednesdays from 10 a.m. to 11 p.m. at the Tower Barracks library. For more on library programs and services, visit the library webpage, or call the Rose Barracks library branch at DSN 476-1740, CIV 09662-83-1740, or Tower Barracks library at DSN 475-1740, CIV 09641-83-1740.